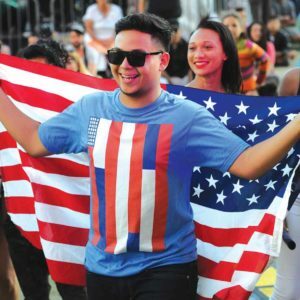 For the fifth year, Grand Park and The Music Center will present downtown’s largest Fourth of July party from 2 to 9:30 p.m.
Grand Park prepares for Fourth of July. Angelenos will enjoy entertainment that highlights the sounds of America featuring jazz, funk, blues and classical artists, with DJ sets inspired by these musical genres. The day’s festivities include a kids’ play area, live music performances, L.A.’s best food trucks, a mobile vendor and activity area. The fireworks show shot from the roof of the Music Center’s Dorothy Chandler Pavilion will be set to pop and classic hits along with patriotic music, and visible throughout Downtown L.A. and the surrounding neighborhoods. The event will span from Spring Street to Grand Avenue, and from Temple to Second streets.